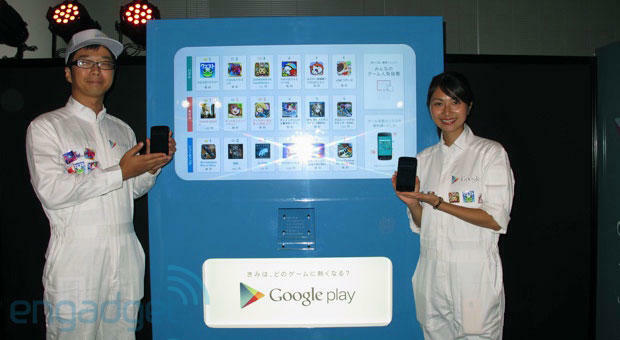 Google announced today it will launch three app store vending machines in Tokyo, where Android users can download new mobile games using NFC, Engadget reports. Each machine will offer 18 games, offering a mix of free and paid apps for any smartphones running Android 4.0 and up. The machine features a massive touchscreen display and a tray to place your handset while it downloads new apps. The new Google Play vending machines are also geared towards non-Android users. If you're using an iPhone, BlackBerry, Windows Phone or just a regular feature phone you can borrow a Nexus 4 to try out some apps. The machines are flanked by two Google employees, however, in case you were thinking of grabbing the device and running. For now the promotion is only available in Japan, where vending machines enjoy wide-spread use. In the U.S., Google has an extremely limited physical retail presence. Some of its devices, including Chromebooks, are sold at chains like Best Buy, but the company has refrained from opening its own store fronts in the Western world. In Asia, however, the search giant takes a more aggressive approach, and already boasts a number of Android Nation brick and mortar stores in Indonesia and India with plans for over 50 total. Now, it can add a few Japanese vending machines to the list as well.